Sage Enterprise Management HR reporting is faster and simpler with this solution based on our ELT Data Warehouse automation software, ZAP Data Hub. Optimized for Sage Enterprise Management HR, it automates data access, integration and preparation. Due to their complex nature of Sage Enterprise Management HR data and its limited reporting and analytics functionality, it can be difficult to get true business intelligence from this popular HRM system. ZAP Data Hub’s Sage Enterprise Management HR reporting solution makes reporting fast and simple, thanks to smart data connectors, pre-built data models and analytics. ZAP Data Hub’s Sage Enterprise Management HR (formerly Sage X3 People) reporting solution supports all version of the software. For businesses considering migrating from one version to another, ZAP Data Hub can help maintain reporting continuity, and make reporting from decommissioned, legacy versions simple. ZAP Data Hub is ELT data warehouse automation software that removes the need for manual reporting processes. It automates the access, integration and preparation of data from Sage Enterprise Management HR. The complex, time-consuming manual report preparation that slows down IT teams becomes a thing of the past. With ZAP Data Hub, reporting from Enterprise Management HR is timely and efficient. The risk of making decisions on inaccurate information is increased when reporting processes are manual and ungoverned. Human error and key-man dependency seriously impact the accuracy and availability of critical business information. ZAP Data Hub’s Enterprise Management HR/X3 People reporting solution removes this risk and delivers consistent, accurate and trusted reporting across the business. ZAP Data Hub will automatically integrate and unify each instance to provide cross-functional reporting. As well as Sage Enterprise Management HR, ZAP Data Hub is optimized for all other Sage solutions, as well as Dynamics, Salesforce, SAP Business One and SYSPRO, with pre- built connectors for over 100 other financial systems and databases, too. ZAP Data Hub’s Sage Enterprise Management HR reporting solution can connect to cloud and local, on-premises installations of other HRM systems. Additional data sources – again cloud or on-premises – can also integrated for enhanced. 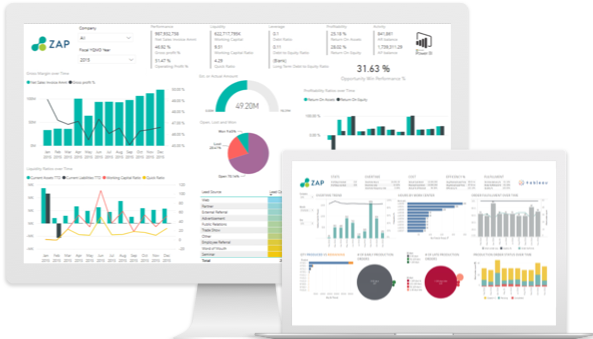 Consistent, accurate, trusted financial and operational reporting can be delivered from Enterprise Management HR/X3 People in Power BI by using ZAP Data Hub to automatically access and structure your data in a pre-built data warehouse. ZAP Data Hub’s smart data connectors and pre-built data model for Sage Enterprise Management HR automates data preparation for Tableau. ZAP is a Tableau Technology partner, our mission is to make reporting in Tableau as easy as possible. ZAP Data Hub is the best choice if Qlik is one of a set of BI software tools in use, or if the business is migrating from one to another. For Qlik users, ZAP Data Hub provides the fastest way to report from Sage Enterprise Management HR.